I rarely buy souvenirs when I travel, I just take millions of photos and display them around my house. I’d rather have a photo I took of the Eiffel Tower rather than a tacky little model that will collect dust on my mantelpiece. So I’m always looking for cool and creative ways to display my shots. The problem with Instagram shots is the quality is rarely amazing so you can’t print them too large. 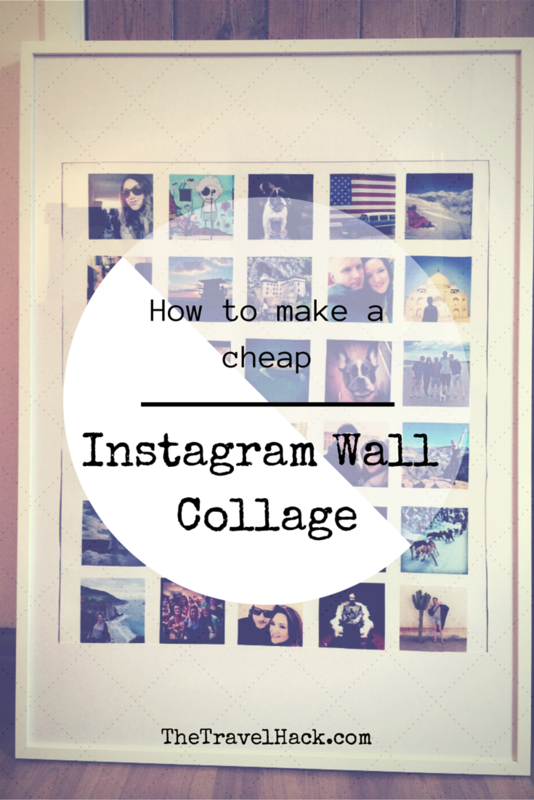 This makes an Instagram wall collage the perfect option! I used PhotoBox to print my Instagram pictures. When I signed up to PhotoBox I got 80 free prints so I only needed to pay for postage and packaging. This was less than £2.50 for First Class delivery in the UK. You currently get 40 free prints but that’s still enough to make a collage. The best thing about using PhotoBox is you can link your Instagram account to your PhotoBox account so it’s really easy to select the photos you want. Top tip for printing Instagram photos: When you’ve selected the photos you want to use you can go back and review your order. While you’re here, make sure you select the ‘Shrink to fit’ tick box next to each photo. This means it will print out square rather than cropping your image to the normal rectangular photo shape. I used a large frame from Ikea. It’s similar to this one but I bought it years ago and I don’t think it cost more than £6.00. It used to display a Mr Brainwash poster I’d picked up for free at an exhibition. But free posters don’t last forever and it started to fade so I simply flipped the poster over and glued my photos onto the reverse side using Pritt Stick. I couldn’t find a long ruler so I used a few pieces of card to get my photos as straight as possible. As I had 80 free photo print outs to use when I signed up to PhotoBox I obviously used them all. I had plenty of spares to use up and experiment with different photos. The photos with minimal editing look best. I found that my older Instagram photos that were heavily processed with different effects and filters did not print so well. Photos with no frames look best. The photos are fairly small so you don’t want to waste space with borders and frames. Make sure you get people in your photos. If you travel a lot you will undoubtedly have lots of Instagram photos with beautiful scenery. This look gorgeous but if you’re displaying it in your home try and mix them up with photos of your friends and family and yourself too. Not only is this a great way to decorate your own home but it could also be a really nice (and pretty cheap) personalized Christmas gift. Definitely making at least 2 of these for christmas presents for my best friends. 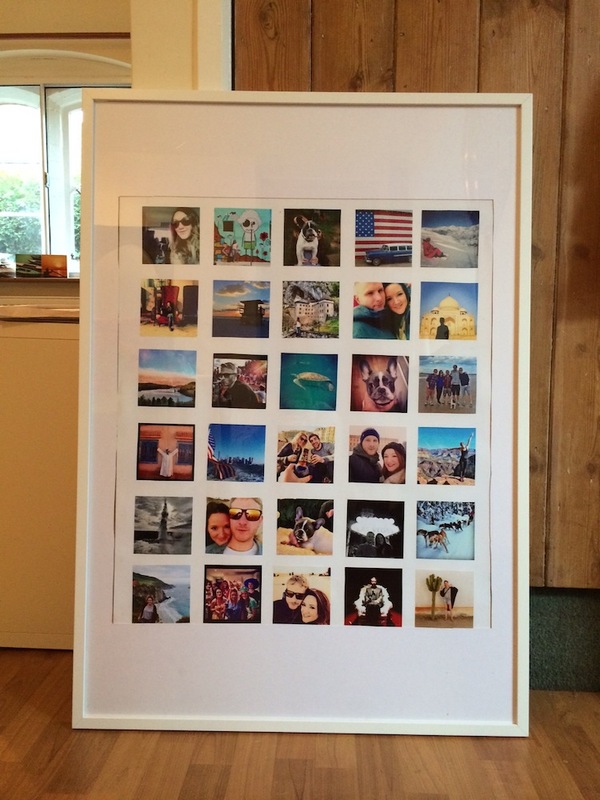 Such a cool idea – the best presents are the ones that are personalized! Definitely, I think these would make a great Christmas present! Love this! Its such a neat idea to create something to show off your favourite instagram snaps, as they always capture such special moments and memories! They do don’t they. My phone is always right there in my pocket so I never miss a moment but I often find the moment has passed by the time I scramble around the get my DSLR out my bag. And then everyone freezes the moment they see it! Wow this looks great! Would definitely make someone a good Christmas present! My mum already has it on her wish list for Christmas! Gorgeous – I have some that an Aussie company prints but making it yourself would definitely be cheaper and more fun – I wonder if I can do it without the doggy assistance?! He’s so cool! Gorgeous! what a great and inexpensive idea. At first I thought you had also used a magnetic board (the Pritt stick looked like a round magnet) and thought it would also be great to be able to move around things like tickets stubs from the different journeys. That would be such a cute idea with a magnetic board!